Rona and I hope you’re enjoying our Flowers In Pots series. Perhaps you’ve potted up your primula plants and agapanthus bulbs. Our plan as part of the Flowers In Pots series is to also write a monthly post on the ‘fundamentals’, as in other things you need to consider when putting pots in your garden or home. First of all, we’ll be covering the different types of pots available on the market and today’s post is about terracotta pots. Terracotta, which means ‘baked earth’ in Italian, is refined clay and is probably the oldest of all container materials. Pots made from terracotta are generally quite cheap and many of them are machine made, with practical purpose rather than beauty in mind. However, there are also highly ornate types available which are either made on a potter’s wheel or moulded by hand…and therefore command a higher price. 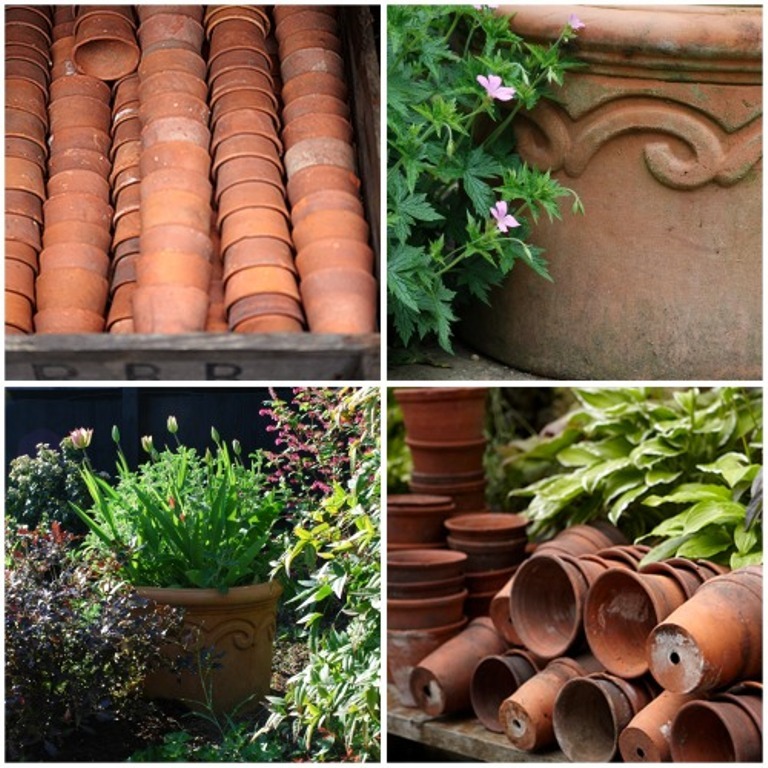 So, what are the advantages of using a terracotta pot? They come in a large variety of different designs. Their look improves with time, as they develop a patina with age. Terracotta breathes which means that compost is less likely to overheat in the summer or become waterlogged in the winter, compared to a plastic container. They are durable and will add weight and stability to a display, making them ideal for long-term planting. They’re attractive and complement a wide range of plants. Terracotta pots are brittle and will break if dropped. Their porous nature means that compost needs to be regularly watered, as it will dry out more quickly than some other types of pots, like plastic. Larger terracotta pots can be heavy to manoeuvre should you need to bring them inside during the winter or change your mind about their location. There is a danger of frost damage, so it’s best to buy pots with a frost-proof guarantee. So if you’ve not had chance yet to pot up your agapanthus bulbs, terracotta pots would be ideal! IPlease may I suggest you add an article with ideas on different ways to arrange a small or medium collection of pots. I have about 15 Wychford pottery pots and I am struggling to k ow the best way to arrange them. Thanks for your comment Chris. I’ll happily write something about how to arrange a collection of pots, thanks so much for the suggestion. In the meantime, why not have a look at Pinterest or Houzz for some inspiration. Generally speaking, odd numbers work best but it depends on the application. If you want a cluster of pots against a wall or at the corner of a terrace then a mixture of sizes always looks more balanced, but if you wanted to place them on a flight of steps, for example, then pots of the same size would probably look better. You can vary the plant heights and shapes too for added interest and effect.